When I was staying in Seletar, I often go to Ikea Tampines for my dessert fix of Daim Cake. Since I moved here 3 years ago, I stopped as the place is out of the way and going to the one near town is not possible as parking is an issue over there. During an appliances hunt last month at the mega hub, we popped over to this eatery. Hubby was so sweet to get me my sugar fix as I had totally forgotten about my soft spot for this cake. Rekindle my love for it, I can't wait to recreate this at home. Thus today, maximising my time before I sent my girl for tuition, I went about quickly to make this cake. After all, I estimated that I only take 1 hour to get everything done with 15 mins baking time. I reckon that I can complete the whole cake in 45 mins + 15mins of shower time. Boy, I was wrong. Removing the wrappers already took me a good 10 mins! Unfortunately, with my ailing memory, I can't recall how it taste like right now. Thus I am not sure whether this is as close to the one I eaten. Let's hope my sister can share some light to it …. Er… perhaps not as she is not really into dessert. Or perhaps if there is still any remaining for hubby who is coming home tonight! Yea! I am so relieved to know my man is coming home. Verdict: My sister and her hubby finds it too sweet. Hubby said it is close but not there yet. If you try it, please let me know how close I am to the real stuff so that I can go back to the drawing board. Thanks. 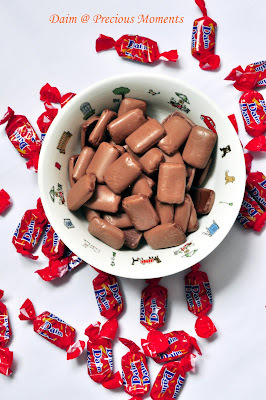 Melt daim over a double boiler till it melted. Remove. Blend in cream. Set aside. Preheat oven to 180 deg. Line cookie tray with silicone mat. Whisk egg white and sugar till stiff peak. Fold almond into the egg white. Spread batter into 3 disc approx 7". Making sure they are even. Bake for 10 - 15 mins. Put the first dacquoise disk as base. Add in the second dacquoise. 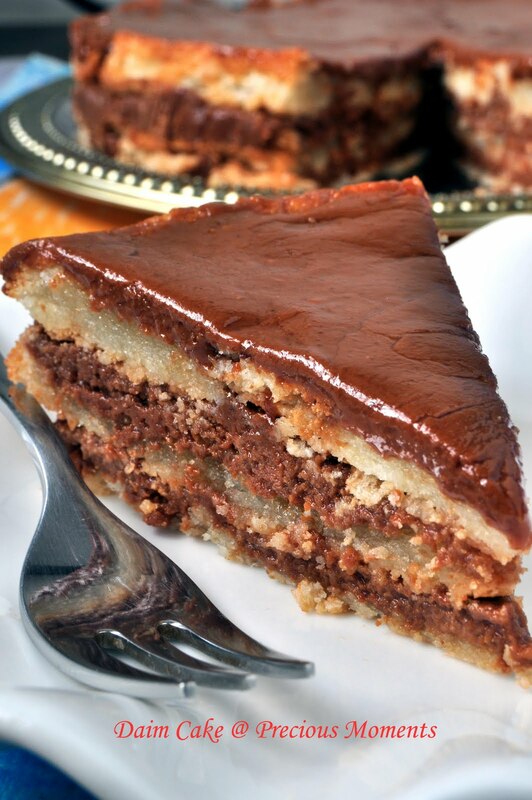 Add the third dacquoise and pour in the remaining Daim mixture. I love the Daim cake, Edith! I try for you =P haha. Great idea to recreate it! I have not tasted this cake before. Looks delicious. Edith...i miss this cake at Ikea also!! No idea what Daim Cake is, but yours sure looks good! Great try!